USB Add-In CardBus Card - Custom Sensors, Inc. 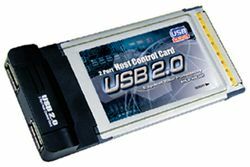 The PU-212B is a USB 2.0, Type II, 32-bit CardBus plug-in card. It supports both the lower speed USB 1.1, used by most USB devices, and the newer high speed USB 2.0. It can be used to add USB capability to a computer without it, or add USB 2.0 capability to a computer that has USB 1.1. USB 2.0 drivers are supplied for Windows 98SE, ME and 2000. Windows XP has native USB 2.0 support. The card contains two Type A USB connectors. · Pentium II 233MHz. (or equivalent) CPU, or better. · CardBus* Type II slot. · Windows 98SE or higher. *CardBus is the newer 32-bit, 33Mhz. version of PCMCIA. This card will not work on computers with 16-bit PCMCIA Slots.